The post Can Dogs Eat Bacon? Get the Facts About Dogs and Bacon by Sassafras Lowrey appeared first on Dogster. Copying over entire articles infringes on copyright laws. You may not be aware of it, but all of these articles were assigned, contracted and paid for, so they aren’t considered public domain. However, we appreciate that you like the article and would love it if you continued sharing just the first paragraph of an article, then linking out to the rest of the piece on Dogster.com. 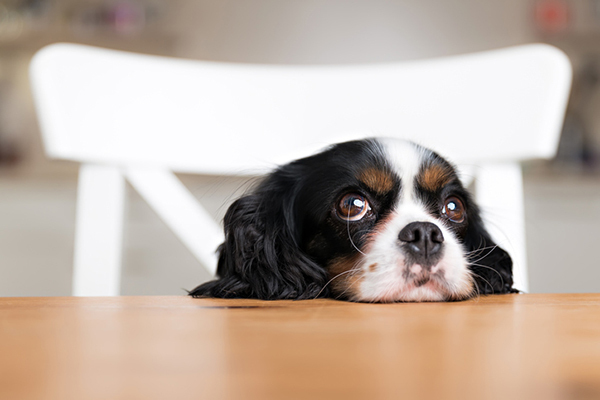 Dogs love human foods, but not all human foods are good for dogs. Bacon is a two-legged favorite, and also a trendy addition to many snacks and meals. From bacon donuts to bacon-wrapped appetizers, people eat a lot of bacon. In fact, it turns out that the average American eats nearly 18 pounds of bacon each year! Dogs might love bacon, too, but is bacon actually safe for dogs to eat? Can dogs eat bacon? Dogs might like bacon … but can dogs eat bacon? Photography by fotyma/Thinkstock. As much as you might like bacon, you’ll want to really limit how much of it you let your dog get access to — if you even decide to allow your dog to eat any of it at all. Too much salt isn’t good for dogs, and bacon is so rich that it can really upset the digestive systems of some dogs. Can dogs eat bacon? How much bacon can dogs eat? The most important thing to remember when thinking, “Can dogs eat bacon?” is that bacon should only be given to dogs as an occasional treat. If you choose to feed your dog bacon you’ll want to limit how much your dog has, and how frequently he gets it. Jenna says that if you are going to feed bacon to your dog, a reasonable serving size for a treat would be as follows. “For a small dog a ¼ strip is fine and a ½ strip is reasonable for a larger dog,” she advises. There are also a number of commercially available “bacon-flavored” dog treats and while these should still only be given to your dog as a training reward or occasional treat, they’re much healthier options. Emmy award-winning veterinarian Dr. Jeff Werber further advises to avoid or limit giving bacon to dogs because it’s so fatty. Pancreatitis is the primary health concern regarding dogs eating bacon. It’s a disease caused by an inflammation of the pancreas due to digestive enzymes attacking the pancreas. This condition may occur when dogs eat too many fatty treats. Pancreatitis is very uncomfortable for dogs and the condition can be very serious and requires veterinary treatment. Thumbnail: Photography © AprilCarlsonPhotography | iStock / Getty Images. Sassafras Lowrey is an award-winning author. Her novels have been honored by organizations ranging from the Lambda Literary Foundation to the American Library Association. Sassafras is a Certified Trick Dog Instructor who trains in Dog Agility and Rally Obedience. Sassafras shares her home with a senior Chihuahua mix, a rescued Cattle Dog mix and a young Newfoundland, along with two bossy cats and a formerly feral kitten. Learn more at sassafraslowrey.com.